Although PDF represents the bulk of content in ECM systems the majority of such implementations do not handle PDF documents much differently than they way theyve handled TIFF images for the past 25 years. Here are a few lesser-known facts about PDF that are essential information for ECM and information management professionals responsible for document management. The inherent flexibility of the PDF format means that there are an extraordinary variety of ways to package text, images, vectors, fonts and more together in order to achieve a reliable, sharable page. But that doesnt mean that every PDF is equal. Some PDF production software makes files that cant be searched. Others produce documents that open or render to the screen very slowly. Still others display incorrect colors, or screw up encoding the source document's fonts so that text turns into little blocks. What to do: Dont compromise on quality. Use established, reputable, PDF libraries, APIs and end-user software. There are many choices available to suit every need and budget. Be aware that many commonplace software can destroy important aspects of PDF documents. Apples Preview will destroy digital signatures, tags and more. Instead of adding proper PDF annotations (which can easily be removed), Evernotes popular tool trashes PDF pages by permanently obscuring page-content with its "notes". What to do: Disallow software that risks your documents and does not respect the methods for annotations and other features available in PDF. and some avoidable ways to get it wrong. What to do: Be sure your search software can find all the information you need to remove. One easy check; compare the number of search-terms found by different tools. There will often be a difference. For redaction tools: educate your users that a black highlighter does not "remove" anything, and is in reality a simple way to get fired for leaking sensitive information. 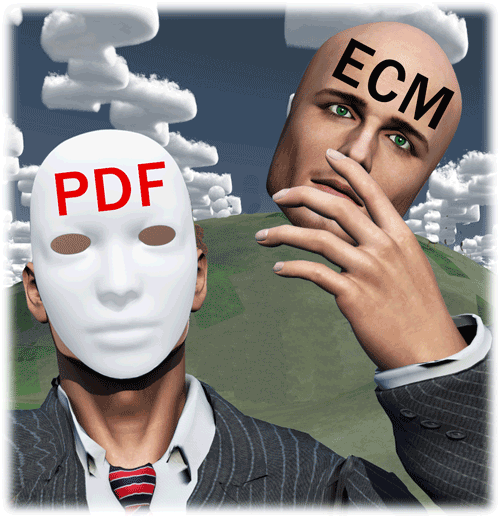 PDF documents can include far more information than most ECM applications are capable of recognizing. From document metadata to digital signatures, from attached files to archival-grade PDF, most of todays ECM systems just don't understand the PDF format beyond the minimum of what's necessary for rendering. Outcomes include content missing from search results, loss of metadata and other vital workflow information, as well as failures to meet regulatory requirements. Your systems and users transact PDF files more than any other type of electronic document. PDF deserves your attention in order to maximize its utility... and minimize risks from misuse.